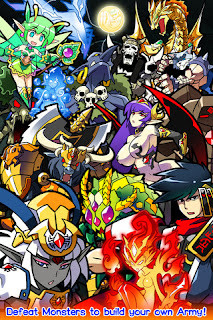 MonTowers: Monster Mayhem & Collection — Mobers.ORG — Your Daily Source For Mobile FUN! BuffStone’s MonTowers has players collecting, raising, and fighting a stable of fierce, fantastical monsters in order to climb to the highest levels of the MonTowers. The game begins with the player learning about the process of summoning and upgrading monsters in order to conquer the Novice Tower. Doesn’t sound too imposing, but the towers certainly get more ominously named: Dark, Blood, Doom, Brutal, Demon, and Hell Towers complete the set. To defeat the towers, the player’s monsters must fight and win against the new monster featured on each of the tower’s levels. Winning also earns prizes—a potion, token, or monster coin, in addition to the experience points required to level up. In order to summon new monsters, the player needs the coin for the monster to be summoned—the Werebat is summoned with the Werebat coin, for example. In addition to the coin, each summoning requires a certain number of elemental gems that the player collects from the Field. Air, Earth, Water, Soul, and Fire gems are easy to collect, but only a certain number can be collected in a given period of time before the player has to wait for their energy to replenish. Most of the game’s interface is focused on utilizing its various menus. 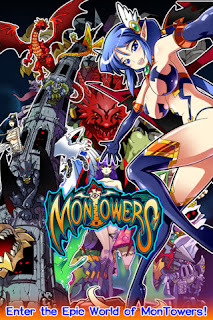 MonTowers is very much a collection game rather than an action title, although the player does participate in the monster battles by choosing the moment his or her monsters attack. During the battles, a bar across the bottom of the screen is displayed. In the center is a red section, and when the silver timer enters this section, it represents the optimum time to strike. 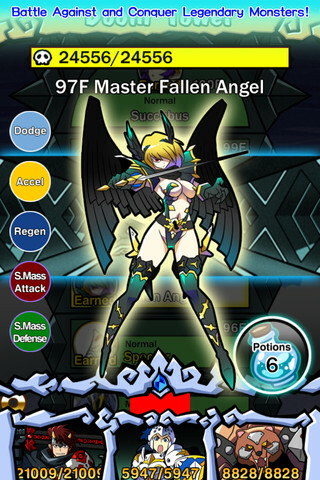 The player can use up to three of his or her monsters in each battle, choosing them after viewing the opponent’s stats. As with most collection games, the primary appeal of MonTowers is completing one’s collection. 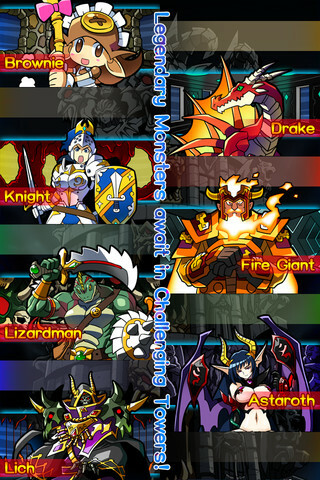 There are (judging by the available slots) 200 monsters to collect. 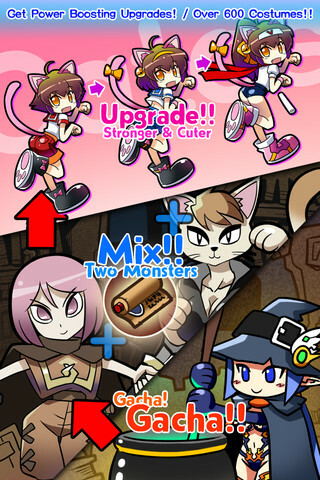 Each can also be upgraded twice, and upgrading enhances the monster’s appearance. Monsters range from adorable (like the elfin brownie) to ferocious (like the goblin) to positively creepy (like the living doll—a sort of eyeless anime manikin). When a monster is unsummoned or killed, it can be resummoned with the appropriate gems, but loses its upgrades. Upgrades require in-game currency—tokens. Tokens are also used for instant summons and upgrades (the waiting time for each gets progressively longer as the player acquires more advanced monsters). All in all, the game is extremely satisfying for the sort of compulsive, detail oriented gamer that delights in collection games. MonTowers parallels collectible card games in that way. 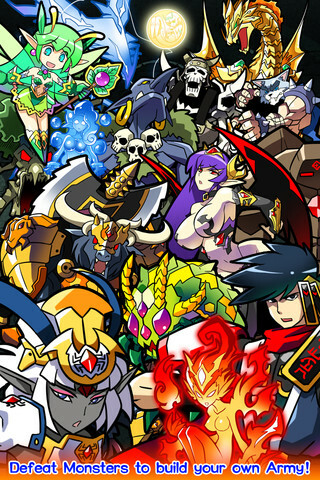 The game’s graphics aren’t really revolutionary, but they’re bright, clear, and imaginative. The fight scene sound effects are great, and the rest of the audio is clearly intended to be unobtrusive, arcade-like background music, and it succeeds. The $0.99 download fee includes the entire game (there are no expansions for paid download at this time), and with 200 monsters, some very challenging combat levels, and plenty of upgrades to keep players busy, that’s a lot of game for under a buck. Where it might hit your wallet, depending on your personal level of impatience, is in-app purchases. Tokens are available for cash purchase, and with tokens required to upgrade, skip wait times, and open up more spots in the “lab” to keep monsters on call for battle, you’ll want more than you have, and they’re acquired slowly within the game. They’re not terribly expensive, though, so MonTowers is still a great deal. 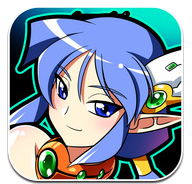 It’s available now in the iTunes App Store.